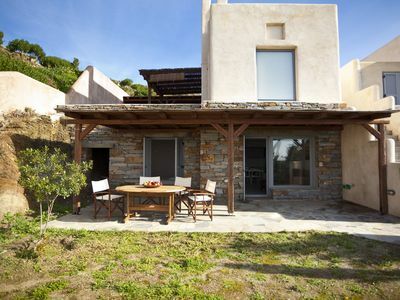 The property consists of 2 (two) SEPARATE UNITS, estimated to be 300-400 years old ,both of which have been architecturally restored and reinterpreted from the original ruins. 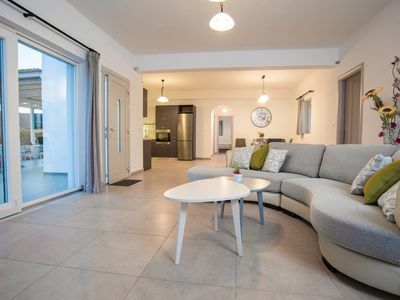 Both units can be rented either separately or together and share a spacious patio area with expansive views of both the Aegean Sea and the village.. 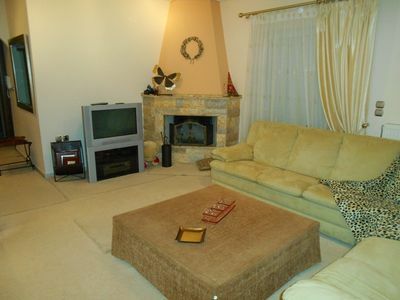 The property is ideal for large groups who appreciate both space and relative privacy. 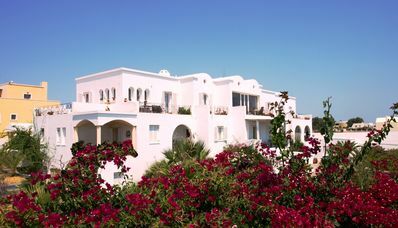 The MAIN HOUSE (advertised here) retains the unique architectural style of Santorini while introducing more modern features such as a domed skylight in the living area, sunken bathtub in the recently renovated master bath and the convenience of a modern, fully-equipped kitchen . 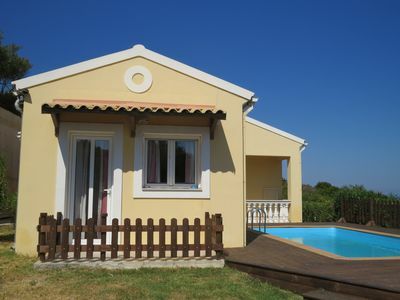 It has 2 private bedrooms and single, built-in beds in the living areas. It can provide sophisticated yet comfortable accommodation for up to 8 (eight) persons. 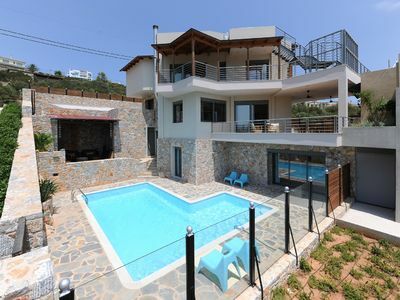 There are 2 large patio areas both front and back for outdoor dining /entertaining , providing beautiful views of the surrounding mountains, as well as beautiful sea and village views,. The European Union has designated the village a ‘traditional settlement’ in an effort to preserve its distinct character. You will marvel at the examples of 'cave' dwellings with their unique design and although not so common these days, if you're lucky, you'll get a glimpse of a villager on his donkey or the locals methodically ringing the church bells in the centre of the village. 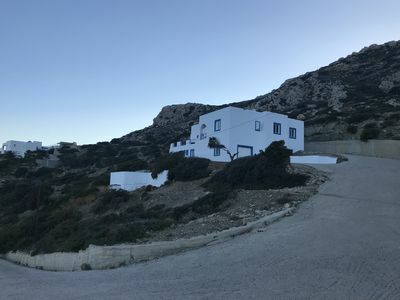 An Island Retreat: A holiday here affords the visitor a unique opportunity to experience the magic and tranquility of traditional Greek island village life, broken only by the sound of occasional church bells or the bray of a donkey, as it was 50 years ago, prior to the earthquake of 1956. Its serene setting provides both privacy and a retreat from the hustle and bustle of a resort or hotel while being situated a mere 15 minutes by car from the capital of Fira or only 5 minutes from the beautiful, black, sandy beach of Camari, both with a myriad of restaurants, cafes, bars, and clubs to cater for any taste. Whether you're a party animal or just want to get away from it all, this property is ideal for large groups or small -both outdoor and indoor entertaining. 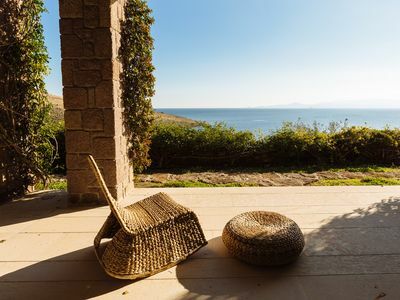 Savour Greek Island Life: During your stay, watch the sunrise from the expansive terrace, the moon rise out of the sea in Camari or take a short ride up to the neighboring village of Pyrgos and Santo Winery to see a magnificent sunset, away from the crowds. 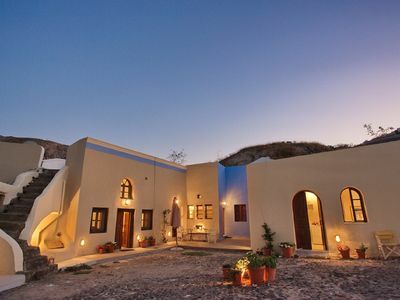 Alternatively, take a stroll through the village, with its air of mystery, and stop at Canava Argyros or Roussos to sample a glass of locally produced wine from sun-drenched grapes grown in Santorini's volcanic soil. Take a litre of 'Brusco', or 'Vinsanto' directly from the barrel home with you to enjoy before or during dinner. 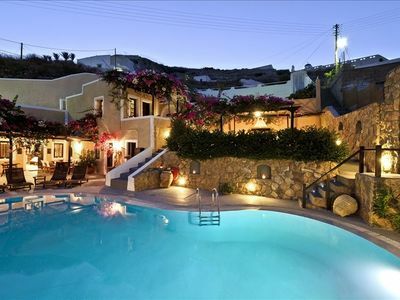 Then again , after a long day at the beach, you may prefer either to enjoy the quiet of a simple, home cooked dinner on the terrace, take in a movie down the road at one of the most beautiful, charming open-air cinemas in the Mediterranean or venture out to experience the some of the exciting night-life the island has to offer. Whatever you choose, your stay here will bring memories to last for a lifetime. - Tired from a long day at the beach and want to do some home entertaining? Catering can be arranged so you don't have to lift a finger. 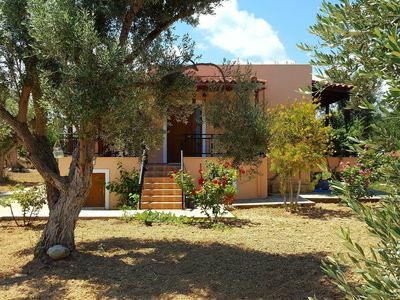 Arrangements can be made for: private boat tours, wine tours, yoga lessons, massage, Greek cooking lessons, Basic Greek language lessons. 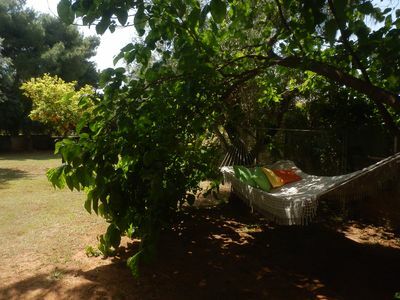 The property is ideal for specialty groups- any group with a special interest such as hiking, yoga, meditation, cooking etc. You get the group together, decide what you would like to do when you're here and we can help you plan a programme designed just for you, with any combination of activities. 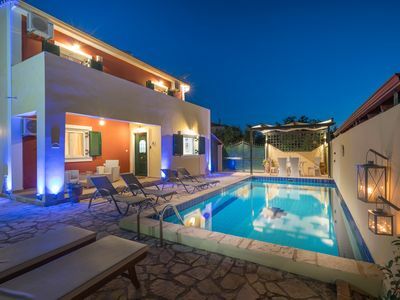 Unlike most rental properties in Santorini, this magnificent 250m2 villa is located in the most unspoilt village on the island- ‘Mesa Gonia.' 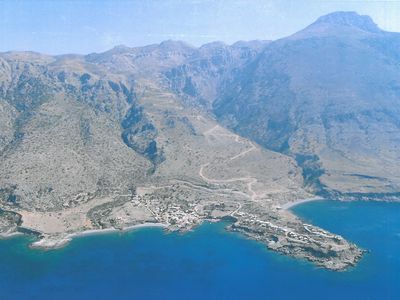 'Episkopis Gonia,' as it is also called, dates to the 17th century and is the site of the oldest Byzantine Church on the island, built in the 12th century. The EU has designated the village a ‘traditional settlement’ to preserve its distinct character. 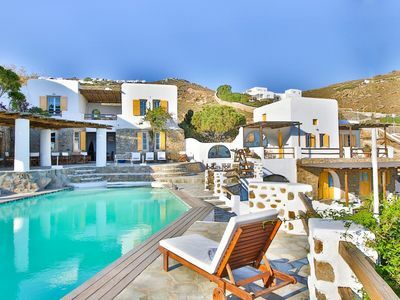 While within easy reach of Fira (the capital) and only 5 minutes by car from Camari, (with its beautiful black sandy beach), its serene setting provides both the privacy and tranquility while giving a taste of traditional Greek island village life as it was 50 years ago. Here you can see the famous 'cave houses' as they were just after the earthquake of 1956 or easily explore the wine roads of the surrounding hills. Local wineries provide delightful wine tasting. and the village now even boasts Santorini's own new micro-brewery, with its Yellow Donkey beer- a 'must try'. See how they brew up their original Red Donkey or Crazy Donkey beer - then take some home with you..There is also a charming open air cinema within walking distance , with live music performances in the peak months. 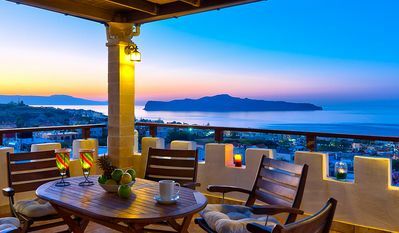 SantoriniParadise: HELIOS villa, amazing sunset views, perfect dream vacation! 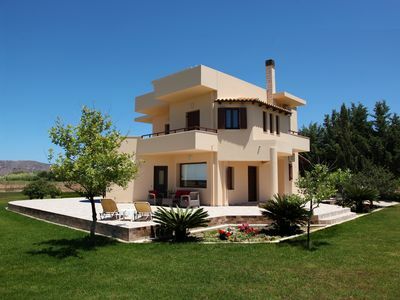 Super luxurious villa with private swimming pool, for an accommodation with all comforts!